Beetles are easily identified by their hard outer shell, which coves their wings. Their wings are exposed only during flight. A beetle’s body consists of three sections: a head, a thorax, and an abdomen. Several types of beetles feed on wood. This can cause a lot of damage to wood structures primarily because while the wood is being eaten, the beetles remain unseen. this is true of Powder Post Beetles, Old House Borer Beetle, Bark Beetles, Citrus Long-Horned Beetles, Asian beetles and other species. Powder Post Beetles, among others, grow from eggs that are laid in the wood. Another species of beetle, the Citrus Long-Horned Beetle, was introduced into the United States as recently as 1999, and is currently without any natural enemies. Although not known as yet, the damage they will create is expected to be extensive. Adult beetles do not eat wood, only larvae do. When you see holes in either structural wood or in furniture, it is because the larvae have already left and you are seeing the exit holes. this could be an indication of a nearby infestation. Generally, beetles are attracted to the same type of wood from which they were born. Other beetle species feed on garden plants, such as the Colorado Potato Beetle, the Boll Weevil, the Rose Chafer, the Western Corn Rootworm, and many more. Each of these beetles can cause millions of dollars in damage to crops of many different kinds. 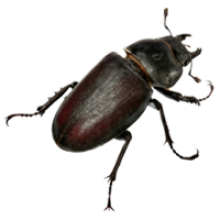 the presence of just a few beetles usually indicates that more exist, so it is best to contact a qualified Pest Control agency. Treating for beetles requires proper knowledge of the type of beetle species you are trying to eliminate. Wood eating beetles, for instance, cannot be effectively treated using sprays because they are located deep within wood. If you think you may have a beetle infestation, your local pest professionals will have the knowledge, resources and solution to the problem.